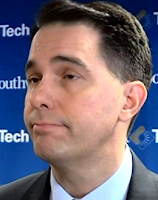 DemoCurmudgeon: Walker's AG Schimel's rigged system, setting Milwaukee up for more Violence. Walker's AG Schimel's rigged system, setting Milwaukee up for more Violence. Urban Milwaukee's Bruce Murphy: It was a bipartisan effort by state representatives Chris Taylor (D-Madison) and Garey Bies (R-Sister Bay) that created the law passed in April 2014 requiring an outside investigation of any police-involved deaths. The law seems particular far-sighted in the case of Sylville Smith, the man killed by a Milwaukee officer, (resulting in the Sherman Park neighborhood violence). Yup, it’s another Scott Walker con game, where he brags publicly about a law he knows is just a sham to protect campaign donors; the Milwaukee Police Association. Gov. Scott Walker has bragged about signing the Taylor-Bies law and emphasized the need for independent investigations: “I’m proud to say I’m the only governor in America… who signed a law that says there needs to be an independent investigation any time there’s a death of someone in police custody,” he told the national media while running for president. The fact the state investigation is using retired Milwaukee police officers in the Smith probe. The AG told the media he doesn’t see a conflict in using MPD officers. Milwaukee Police Chief Ed Flynn, while stressing that the body camera video suggested the shooting of Smith “certainly appeared to be within lawful bounds.” Rep. Chris Taylor: “As one of the authors of the officer-involved shooting legislation that requires outside, independent investigators, I can tell you that allowing former Milwaukee police officers to investigate their former department circumvents the true intention of the bill.” Actually, what Taylor was suggesting was exactly what her Republican co-sponsor and former deputy sheriff Bies had suggested about the Dontre Hamilton investigation. When Schimel announces the results of his investigation from his office 75 miles away in Madison, any reaction in Milwaukee will be the concern of Flynn, Mayor Tom Barrett and other officials who must weather the potential storm. I hope I’m wrong, but Schimel’s arrogance, his refusal to recognize the importance of conducting an investigation that looks impartial, could end up being destructive to this city.